Transparency Market Research (TMR) has published a new report titled, “Benzodiazepine Drugs Market - Global Industry Analysis, Size, Share, Growth, Trends, and Forecast, 2018–2026”. According to the report, the global benzodiazepine drugs market was valued at US $ 2,057.19 Mn in 2017. It is projected to expand at a CAGR of 2.7% between 2018 and 2026. 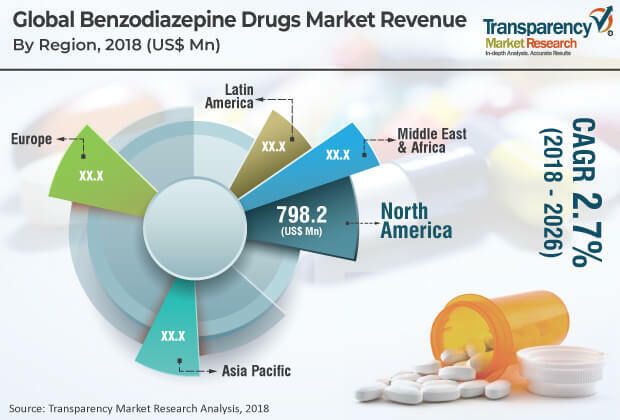 The benzodiazepine drugs market is projected to expand during the forecast period owing to the rise in prevalence of anxiety, seizures, and increase in concerns among people about preventive measures for stress-related conditions. Moreover, higher prescriptions for benzodiazepine drugs, as compared to other psychoactive drugs, and increase in rate of adoption of generic drugs are propelling the global benzodiazepine drugs market. North America is expected to dominate the global benzodiazepine drugs market due to more FDA approvals for benzodiazepine drugs in the region. Latin America and Asia Pacific are potential markets for benzodiazepine drugs. The market in Asia Pacific is projected to expand at a CAGR of 3.5% during the forecast period. Rise in prevalence of anxiety and seizures is a major driver of the global benzodiazepine drugs market. Current lifestyle and urban life have made peoples’ lives more stressful, which leads to mental disorders such as depression, anxiety, panic, and maniac conditions. Psychoactive drugs, such as benzodiazepine, are required to relieve these conditions and attacks. For instance, according to WHO, in 2015, the total number of people living with anxiety disorders, globally, was 264 million. Similarly, higher number of prescriptions for benzodiazepines, as compared to other psychoactive drugs, and increase in rate of adoption of generic drugs are major drivers of the global benzodiazepine drugs market. Alprazolam is expanding segment of the benzodiazepine drugs market. It is projected to account for 29.35% share of the market, and expand at a CAGR of 2.9%, during the forecast period. The segment is anticipated to reach a value of US$ 768.09 Mn by 2026. Extensive utilization of Alprazolam in anxiety and panic disorders and higher number of prescriptions of Alprazolam for these conditions are likely to drive the segment of the global market during the forecast period. Anxiety was a dominant segment of the global benzodiazepine drugs market in 2017. It is expected to maintain its position during the forecast period. The segment is anticipated to reach a value of US$ 1,384.12 Mn by 2026. It is projected to account for 52.9% share of the market and expand at a CAGR of 3.1% during the forecast period. Benzodiazepine drugs are preferred to control the symptoms and general anxiety. Therefore, a rise in the prevalence of anxiety across the globe drives the segment. For instance, according to Anxiety and Depression Association of America (ADAA), around 40 million adults are affected every year with anxiety disorders, of which only 36.9% receive treatment. In terms of time of action, the global market has been segmented into ultra-short acting, short acting, and long acting. The short acting segment held a major share of the global market in 2017. It is projected to maintain its leading position in the market during the forecast period. The short acting segment is projected to hold 77.1% share of the market by 2026. However, the ultra-short acting segment is anticipated to expand at a CAGR of 3.1% during the forecast period. Expansion of the segment can be attributed to the rise in popularity due to its pharmacokinetic activity and less chance for developing drug dependency. In terms of distribution channel, the global market has been classified into hospital pharmacies, retail pharmacies and others. The retail pharmacies segment held a major share of the global market in 2017. It is estimated to maintain its position in the global market during the forecast period. The retail pharmacies segment is projected to hold 54.12% share of the market and expand at a CAGR of 2.8% during the forecast period. However, the others segment, which includes online pharmacies and mail pharmacies, is highly lucrative. It is expected to expand at a higher CAGR of 3.0% during the forecast period owing to better discount rates on online platforms and popularity owing to convenience. In terms of region, the global benzodiazepine drugs market has been segmented into five major regions as North America, Europe, Asia Pacific, Latin America, and Middle East & Africa. North America dominated the global market in 2017. The market in North America is likely to expand at a CAGR of 2.2% during the forecast period. The market in North America was valued at US$ 781.73 Mn, and the region accounted for 38.0% share of the global market, in 2017. This was due to the rise in prevalence of anxiety, panic disorders, and higher FDA approvals for benzodiazepine drugs by major players in the region. The anxiety segment dominated the market in the region. It is projected to expand at a CAGR of 2.6% during the same period. Asia Pacific is a highly lucrative market. It is anticipated to expand at a CAGR of 3.5% during the forecast period due to a rise in the prevalence of anxiety disorders, seizures, increased awareness among people about healthcare, and rise in health care expenditure in the region. The global benzodiazepine drugs market is fragmented in terms of number of players. Key players operating in the global market include Pfizer Inc., F.Hoffmann-La Roche Ltd., Bausch Health Companies, Inc., Mylan, N.V., Teva Pharmaceutical Industries Ltd. and H.Lundbeck A/S. More FDA approvals are received by these major players in North America for benzodiazepine drugs.